Moller International, Inc. 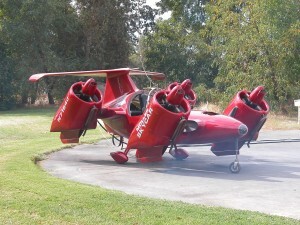 The developer of the Skycar® a vertical take-off and landing (VTOL) capable, high-speed light aircraft, announced that it has established a relationship with American Space Industries (ASI) of Menlo Park, CA to produce sub-scale models of the Skycar®. These electrically-powered unmanned radio-controlled reproductions of the Skycar®are intended for model aircraft fans who want to experience the thrill of flying a VTOL aircraft with the extraordinary characteristics of the Skycar®. Russell Decker, CEO of ASI said, “American Space Industries is very pleased to be working with Moller International to help put this futuristic vehicle into hobbyist’s hands today. Dr. Moller’s Skycar® is a pioneering example of the advanced flight concepts that will help define the future of personal flight. Building and flying a radio control version of this vehicle, and utilizing the latest manufacturing techniques and new super-lightweight materials, the craft will provide hours of fun for hobbyists everywhere. Recent advancements in battery design, material science, and computer technology permit the operation of this radio control model that will closely emulate the extremely precise flight characteristics of the Moller Skycar®“. The Skycar® is not a Quad-copter, it’s much more and this model is the first of its kind at this scale and will be an absolute dream to fly.